Independent college students, often referred to as nontraditional, have become the new majority of the student body on campuses throughout the United States. According to a study done by the Institute for Women’s Policy Research, while 51 percent of students are considered independent, there is an unequal representation of this population throughout college statistics involving success and graduation rates. Not only that, but there are limited resources and programs designed to provide assistance for those who need to support themselves, and sometimes a family, while working towards a degree. It’s as if these students are being ignored in a college setting all together. 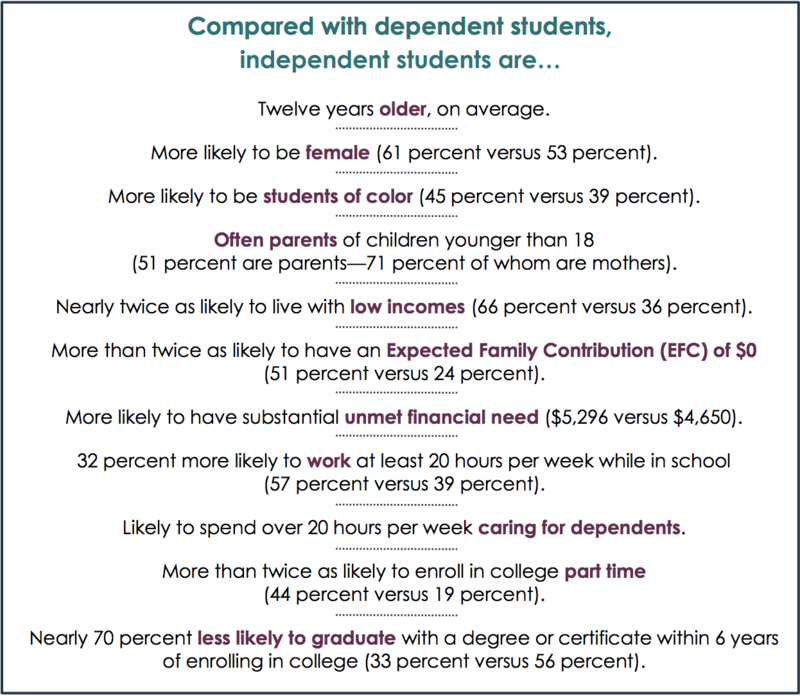 The definition of independent students falls into many diverse categories: at least 24 years of age, married, a graduate or professional student, a veteran, a member of the armed forces, an orphan in foster care, or a dependent or ward of the court since age 13, has legal dependents other than a spouse, an emancipated minor, or homeless or at risk of becoming homeless. The Institute for Women’s Policy Research found that 72 percent of independent students are living at or below the federal poverty line of an annual income of $24,600. Imagine trying to afford modern day tuition prices while supporting yourself, paying off a car, buying groceries or raising a family. If you’re part of the new majority, then you don’t have to imagine – you know. The only support most nontraditional students can receive is that of financial aid, where loans taken out are larger than simply what’s needed to pay tuition. They become a source of survival for students who become so busy with school they can no longer find the time to work a full-time job. It’s time for this demographic to be acknowledged, to receive the support they need and to be given a voice. Henry Ford College does offer assistance to students who find they might need some support along their journey to success, such as The Hawk’s Nest or work study programs. The Hawks’ Nest provides a student enrolled in 1 or more credit hours with nonperishable food items, toiletries, and reusable canvas bags. A student is allowed to stop by once a week. The Hawks’ Nest relies on donations and “works on the honor system; you are not required to document need.” While work study provides students a chance work on campus for a maximum of 20 hours a week. This allows students without reliable transportation, or those who find it easier to work between classes, a chance to earn a reliable source of income. If you are an independent student, give yourself a pat on the back, be proud of what you have done and what you will accomplish. It seems that others would rather look down on college students for never holding a job in high school and believes that is the sole reason to blame for poor statistics on post-college, career success. When as of 2012, independent students are the new majority. It’s easier to demean and lay blame on college students than it is to fathom the idea of looking at an outside influence – such as the job market. Every year, more people enroll in college than the year before, whether they are traditional or non-traditional. According to the National Center for Education Statistics, from 2005-2015, the number of full-time students has increased by 14 percent with part-time enrollment increasing by 15 percent. A majority of these students are like myself, independent. You enter the college life out of the passion to not only want to better yourself, but to better the lives of your family, your neighbors or even the world. A demographic with such a strong presence on campuses throughout the United States should not be left out of graduation and career statistics and decisions by colleges regarding resources for students. They should have a voice too.